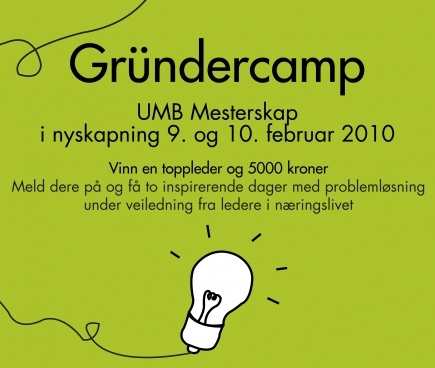 Participate in the UMB Competition in Entrepreneurship (9th to 10th of February) to win a “A top business manager for one day” and 5000 NOK. A real life task from local business is given to be solved within a limited time period. The problem is solved in groups of four to five students. ”A top manager for one day” and 5000 NOK will be awarded to the winners. Register and get to inspirational days of problem solving under guiding from professionals. For more information please visit: http://www.youtube.com/user/UENorge. Show up at Urbygningen 9.am on 9th of February. Official opening speech by Rector Knut Hove. Free lunch on Tuesday.